If your captain license exam is tomorrow, and you haven't done any studying - read this list 10x. I've gone through the database of 14,000 questions and picked out the top one-line statements, that if known, would yield the highest point score. Why? Cause there's quite a bit of redundancy among those 14,000 questions - certain concepts are repeated. The test will find various ways to phrase the statements below in a variety of questions. Work smart, not hard - benefit from that redundancy - a passing score with the least studying statistically boils down to the corillaries below. You are standing the wheelwatch when you hear the cry, "Man overboard starboard side". You should instinctively give full right rudder. A tunnel bow thruster provides lateral control without affecting headway. Dunnage is loose material used to support and protect cargo in a ship's hold. Overcarriage is the carriage of cargo beyond the port for which it was intended. Filler cargo is small durable packages or pieces of cargo that may be stowed in spaces between larger pieces yielding reduced dunnage costs and maximum hold space utilization. Defense plans may cause the operation of electronic aids to navigation to be suspended with no notice. The primary hazard of loading a bulk shipment of steel turnings is that it is subject to spontaneous heating and ignition. A person found operating a vessel while intoxicated is liable for a civil penalty of not more than $5,000. The maximum length allowed between main, transverse bulkheads on a vessel is referred to as the permissible length. Damaged bulkheads often take a permanent set which is independent of the panting or bulge caused by water pressure. To control this, you should install shoring so the shoring supports the damaged bulkheads without pushing on them. Floors aboard ship are frames to which the tank top and bottom shell are fastened on a double bottomed ship. When underway and proceeding ahead, as the speed increases, the pivot point tends to move forward. To determine the weight capacity of a deck in a cargo hold, you would refer to the deck capacity plan. The vessel's "quarter" is located on either side of the stern. A wildcat is a deeply-grooved drum on the windlass with sprockets which engage the links of the anchor chain. A crack in the deck plating of a vessel may be temporarily prevented from increasing in length by drilling a hole at each end of the crack. The turning circle of a vessel making a turn over 360 degrees isthe path followed by the center of gravity. The pivoting point of a fully loaded vessel with normal trim proceeding ahead at sea speed is one-third the length of the vessel from the bow. Under title 46 of the United States Code, the person in charge of a documented vessel who fails to reporrt a complaint of a sexual offense may be fined up to $5,000. The stowage factor for a cargo is based up on one long ton. When improperly tied, the square knot becomes a granny or thief's knot. A vessel trawling will display a green light over a white light. A towing light is yellow in color, has the same characteristic as a stern light, and is shown on the stern of the vessel. A 50 Meter barge anchored in a "Special Anchorage Area" designated by the Secretary requires 2 lights. A vessel approaching a bend in a river or an obstruction that blocks it's view would sound a whistle signal of one prolonged blast. When a power driven vessel notices a sailing vessel approaching from astern it should stand on. Orange smoke is one distress signal. More than two vessels meeting would be considered a "Special Circumstance". A vessel servicing an aid to navigation is exempt from the regulations regarding separation schemes to the extent necessary to carry out their work. 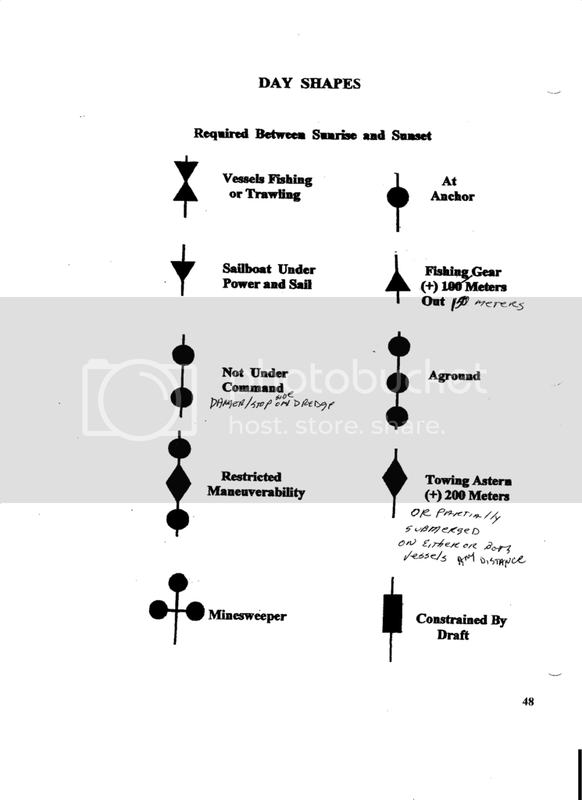 Two vessels meeting on inland waters that will pass starboard to starboard 1/4 mile apart without any maneuvering required for safety require passing signals of two short blasts. A vessel constrained by her draft is one which must be a power driven vessel, only applies when operating in international waters, and must remain in a channel for safe operation. You are navigating in a narrow channel in inland waters and must remain in the channel for safe operation - another vessel is crossing the channel ahead of you from your starboard and you doubt whether your vessel will pass safely - you must sound the danger signal. When you come dead astern on inland waters of another vessel and desire to overtake, you should sound one short blast on your whistle signal. The masthead light may be located at other than the fore and aft centerline of a vessel less than 12 meters in length. The duration of a prolonged blast of the whistle is 4 to 6 seconds. A bell is used to sound a fog signal for a sailing vessel at anchor. If you see a vessel's green sidelight bearing due east from you, the vessel might be heading south or southwest or southeast. A vessel shall be deemed to be overtaking when she can see at night only the sternlight of the vessel. If your vessel is not making way but is not in any way disabled, and another vessel approaches you on your starboard beam - your vessel is the give-way vessel in a crossing situation. Two vessels meeting in a "heads on" situation are directed by the Rules to alter course to starboard and pass port to port. Barge greater than 50m at a "special anchorage area" must have 2 white anchor lights. A partially submerged object towed by a vessel must show during the day one diamond shape regardless of length of the tow. An all-round white light at each end of the tow shall be used to indicate the presence of a partly submerged object being towed. A chart position enclosed by a semi-circle is a(n) dead reckoning position. In order to insure that the racon signal is visible on your 3 cm radar, the rain clutter control should be off but, if necessary, may be on low. The magnitude of a star can range from -1 to 10, with -1 being the brightest. The range of tide is the difference between the heights of high and low tide. A rhumb line is a line crossing all meridians of longitude at the same angle and appears as a straight line on a Mercator projection. A great circle is the shortest distance between two points on the surface of a planetary body assuming a spherical model. To make sure you get full advantage of a favorable current, you should reach an entrance or strait 30 minutes before the predicted time of the favorable current. You would check the Coast Pilot publication for complete information on the Puget Sound weather conditions. A buoy with a composite group-flashing light indicates a bifurcation. NGA (NIMA) charts are adopting the metric system. In order to change a charted dept in meters to feet you may use the conversion table found in: a) the Light List b) Bowditch Vol. II c) on the chart. The Beaufort Scale is used to estimate wind speed by observing sea conditions. SNIP! Deliberately redacted... find this helpful?? Email me for the rest! !